A manned, interstellar survey ship has gone missing. A nuclear terror plot is thwarted just outside Washington, D.C. And it’s an election year. Mandisa “Mandi” Nkosi is a young reporter who, while on a trip to Johannesburg to connect with her roots, is contacted by an anonymous source with evidence that material seized from a nuclear terror plot will point squarely at one of humanity’s most important companies as the supplier. The source also unveils that the “evidence” against the company – Applied Interstellar Corporation (AIC), a science and technology behemoth with more corporate and political foes than can be counted – is a setup, and part of a plot to destroy AIC and gain control of its technological secrets. The deeper Mandi digs, the more of a target she becomes. What follows is a heart-pounding, unforgettable ride through the hallowed halls of big government, far-flung star systems, and the revelation of a conspiracy that runs so deep, Mandi’s life, and the future of humanity, are put at stake. 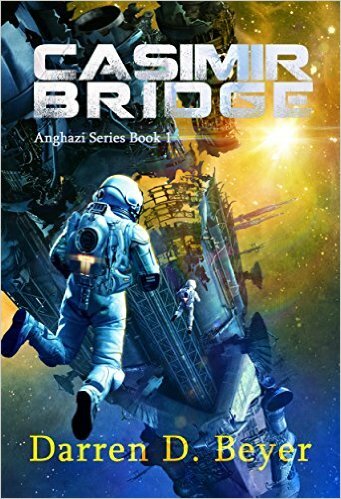 Brimming with tantalizing futuristic technology, deep space adventure, and thrilling plot twists, Casimir Bridge is a nuanced, thought-provoking, and deeply human space opera that draws the reader in and never lets go. A thrilling, fast-paced story that spans two planets, four star systems, and crosses the depths of space. Realistic science fiction, true to the technology and science. Currently relevant undertones including corporate and political conspiracy, nuclear terror, money in politics. Join readers from around the globe in discovering the best new author to hit the science fiction scene. Darren Beyer was born in Washington, D.C., but quickly became a child of the world. His family moved overseas when he was age two and together they traveled extensively throughout his childhood. Darren draws on these experiences to add an element of realism and depth to his writing. At the age of six, he was awakened in the middle of the night by his mother to watch live pictures being broadcast from the surface of the moon during the Apollo 17 mission. At that moment, even at so young an age, he decided to pursue a career related to the space program. In high school, he took classes in math and science. In college at Virginia Tech, he enrolled in the engineering school and received a degree in aerospace engineering in 1989. Following graduation, he was hired by NASA at Kennedy Space Center, where for nearly ten years he worked as a Space Shuttle experiment engineer. While there, he worked on the Hubble launch, as well as numerous Space Lab and other scientific missions. Experiments he was responsible for ranged from telescopes to frog life support. He conducted astronaut training, performed installations onboard the Shuttle just prior to launch, and was part of the recovery crew following landing. Darren has had the honor of working onboard every Space Shuttle orbiter except Challenger. In late 1998, Darren left NASA to become an entrepreneur, and, after more than seventeen years, an author. He is a student of science and technology and is an instrument-rated private pilot. Darren lives in California near San Francisco with his wife, dogs, cats and fish. Visit Darren’s web site at DarrenBeyer.com and his space and technology blog at Tek22.com.